Based on state-of-the-art wireless equipment, PrineTIME Internet Solutions brings you a fast, reliable connection. 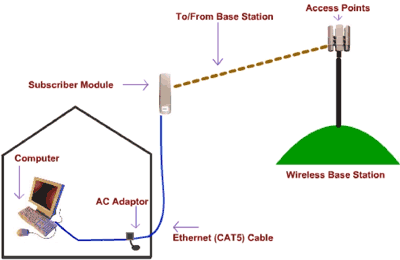 How does a Wireless Internet System Work? What is my e-mail password, can I change it online? Your e-mail password is unable to be changed or given out online. You will need to call our office for all e-mail password needs. What is my network key/password? Your network key/password can be obtained by calling our office. Do you have a snowbird program? We do! We allow you to suspend your service for up to 4 months (w/o charge). Upon your return we you will just owe a 35$ re-connect fee. Absolutely, if you refer a friend you will receive a free month’s service upon their completed install and 1st invoice payment. I have multiple computers, do you charge per computer? No, we charge one flat rate for your household. Is this wireless connection secure? Yes, our wireless connection is secure. How big is the antenna you will put on my home? What does it look like? 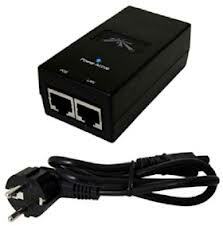 We offer two types of wireless devices depending on your Internet needs and the package you purchase. One pacakge utilizes the Motorola radio and the others use Ubiquiti equipment. The Motorola dish and subscriber module are roughly the same size as typical satellite television unit (please see picture to left for reference). 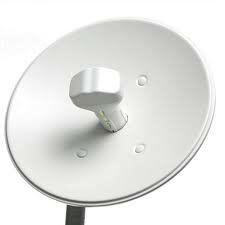 In certain situations a dish is not needed so a subscriber module is only installed. In addition to the subscriber module a power supply will need to be plugged into an outlet and provides power to the unit outside. The power supply for a Motorola subscriber module is fairly small (please see picture to left for reference). The Ubiquiti subscriber module is significantly smaller then the Motorola radio. The dish is approximately 12 inches in circumference (please see picture to left for reference). 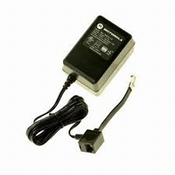 The power supply for the Ubiquiti subscriber module is different in that it utilizes a brick type of power injector, approximately 1 inch by 2.5 inches (please see picture to left for reference). The cable from the outside will plug into the POE port and then a cable from the LAN port will plug into the equipment at the home. 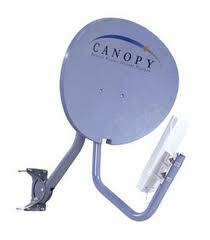 In certain circumstances a larger dish might need to be installed. The technician who does the install will always check with you to ensure that this is acceptable. In addition to this please feel free to stop by our office and ask to see any of our equipment. How fast are the speeds? What speed will work best for me? Here at PrineTIME we offer four different types of packages to accommodate your needs. Please visit our Pricing Page for more details, or please feel free to call our office and we will be happy to discuss them with you. I cannot access the Internet, what can I do to restore my connection? The first thing you will want to check is that your cables are all plugged in tight and you want to verify your equipment has power. You will also want to reboot your router if you have one, by unplugging the power cord waiting a couple seconds and plugging it back in. You can also restart your computer. Will weather affect your equipment? No weather does not affect your equipment you should be online in rain, snow and wind. I receive a notice that my e-mail is over quota; what does this mean and how do I fix it? Being over quota means your (server) mailbox is full. You will need to go to our website (www.prinetime.net), click on check e-mail, login with your username and password, and remove the messages from your inbox that you already have on your computer. When that is complete you will also need to empty your trash folder. 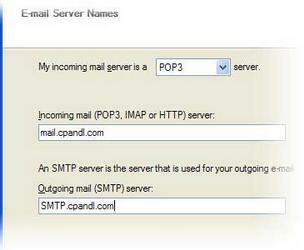 This should empty your server mail and you should be able to receive e-mail within minutes. Any mail sent to you while “over quota” will be returned to the sender. How do I set up my PrineTIME e-mail? You will need to open your e-mail program on your computer. You might have outlook express or windows live mail. You will then follow the instructions below and enter the following POP3 server information when prompted. 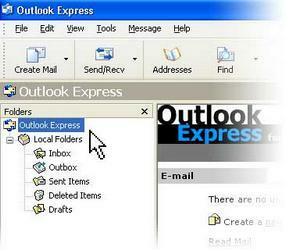 There are many ways to start Outlook Express, but here’s a sure-fire way to find and start. If asked whether you’d like to open this particular account automatically every time you start Outlook Express, click Yes (if you do) or No (if you don’t). If you don’t want to be asked this question again, click to check the Always perform this check…box. Check When Outlook Express starts, go directly to my Inbox. - Find out if your ISP requires you to use Secure Password Authentication (SPA) to access your e-mail account—yes or no is all that’s required. 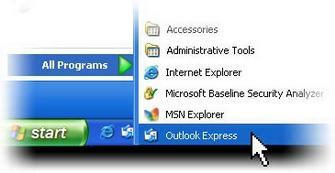 Start Outlook Express, and on the Tools menu, click Accounts. If the Internet Connection Wizard starts up automatically, skip ahead to the next step. Click Add, and then click Mail to open the Internet Connection Wizard. On the Your Name page of the wizard, type your name as you want it to appear to everyone who gets e-mail from you, and then click Next. On the Internet Explorer Address page, type your e-mail address, and then click Next. On the E-mail Server Names page, fill in the first block of information that you gathered from your ISP in step 1, and then click Next. Unsure if your new e-mail account is working? Send an e-mail message to a friend. If they get the message, your account is ready to roll! But if you run into problems setting up your account, Outlook Express offers help. Search for troubleshooting topics from Contents and Index on the Help menu. How do I set up Windows Live Mail 2011 for access to my e-mail account? 1. Start Windows Live Mail 2011. 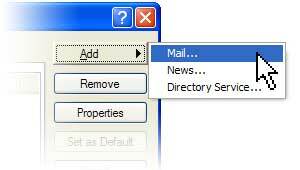 If the Add your email accounts page appears when you start Windows Live Mail, go to step 2. If the Add your email accounts page doesn’t appear when you first open the program, on the Accounts tab, above New Account, click Email. - In the Email address box, enter the e-mail address that was provided to you by the person who manages your e-mail account (for example, tony@prinetime.net). 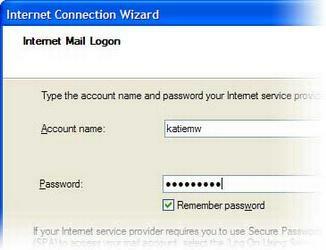 - In the Password box, enter the password that was provided to you by the person who manages your e-mail account. If you want Windows Live Mail to remember your password, select the check box next to Remember this password. - In the Display name for your sent messages box, enter the name you want users to see when you send e-mail. - On the drop-down menu under Server type, select POP. - Under Server address, enter the POP3 server name that was provided to you by the person who manages your e-mail account. Select Requires a secure connection (SSL). - Under Log on user name, type your username which is the beginning part of your e-mail address. - Under Outgoing server, enter the SMTP server name that was provided to you by the person who manages your e-mail account. - Select the check box next to Requires authentication, and then click Next. 5. On the Your email account was added page, click Finish. 6. On the Accounts page, click Close. - In Windows Live Mail, select your e-mail account. - On the Accounts tab, click Properties. - On the Properties page for your account, on the Advanced tab, under Delivery, make sure Leave a copy of messages on server isn’t selected. How do I download your free anti virus and spy ware programs? Does PrineTIME have an Acceptable Use Policy?